Voting for the plan commenced on April 28th and ends May 26th with the Supporting Noteholders in favor of the plan. Holders of the 2018 also expect to vote in favor of the plan. 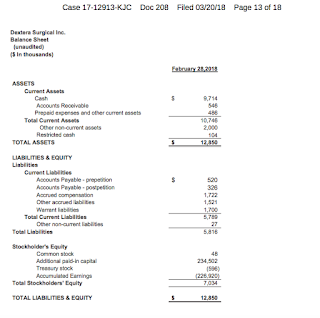 The Company filed with $44m of DIP financing provided by the prepetition secured asset-based lenders and secured Term Loan lenders. 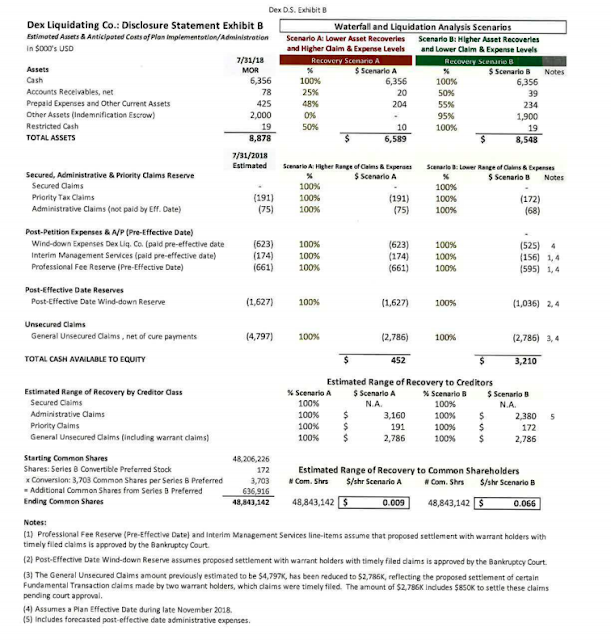 Under the plan the 2021 Note Claims will receive 99.75% of the new reorganized Nuverra common stock and 2021 Noteholder Rights, with an expected recovery value between 43-55%. The 2018 notes receive the remaining .25% and similar rights. The 2021 Notes last traded at $10.80 on May 18th. The exercise price for the rights offering is calculated based on an assumed enterprise value of $350 million. The 2021 and 2018 Notes will both receive rights that will let them acquire its pro-rata share of $75m of new Nuverra common stock (150m total). Lazard is the company's investment banker and places the firm's enterprise value between 270-335m, with an equity value between 230-295m. I strongly suggest you read the Disclosure Statement for the methodology. 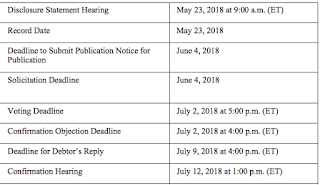 A hearing for the the Disclosure Statement and the Plan is set for June 21st at 10am, with objections due by the afternoon of June 12th. The case is presided over by the Hon. Kevin J. Carey in the District of Delaware.